Guardiaris will attend the upcoming event »The International Defense Exhibition and Conference« (IDEX), the largest Defense and Security Exhibition in the Middle East and North African region, taking place from February 17 to 21, 2019 at Abu Dhabi National Exhibition Centre, Abu Dhabi, United Arab of Emirates. We will be represeneting our products at TRUST International Group stand, a major supplier of premium solutions to the UAE Armed Forces and security establishment. Guardiaris has presented our last developed product SAS-DOME module along with our well known Guard Control Desk (GCD). In October, Guardiaris attended The 2018 Annual Meeting and Exposition of the Association of the U.S. Army www.ausa.org/ausa2018 an event that drew more than 31.000 people. Guardiaris presented its products in cooperation with Ohio Ordnance Works, Inc.
SAS Module is our newly developed system combining IR technology and real firearms. Guardiaris presented Mortar Simulator (M-S) and Forward Observer Simulator (FO-T) along with Guard Control Desk instructor station. 1. Mortar Simulator (M-S) was shown in 60mm version with ''smart'' aiming device and ''smart'' mortar mines. 2. Forward Observer Simulator (FO-T) that provides efficient training for forward observers and allows training procedures of artillery firing. German company Dynamit Nobel Defence showcased simulators (made by Guardiaris) for their RGW 90 and Effector 90 weapons on their booth. Guardiaris and German partner Dynamit Nobel Defence showcased simulation products. 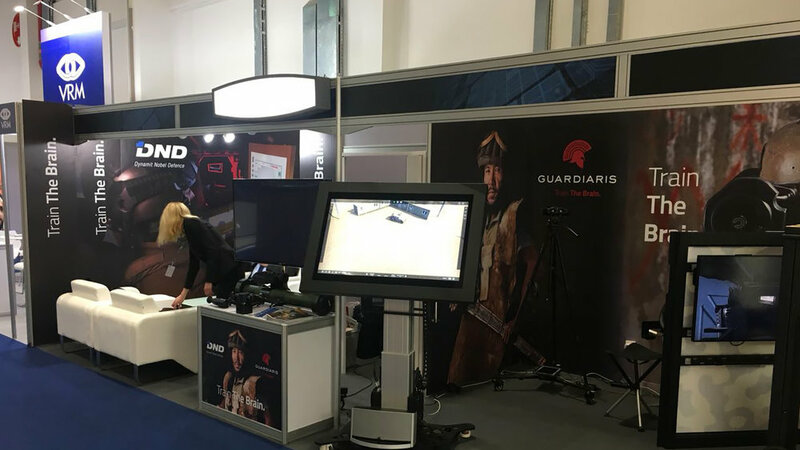 Guardiaris, together with German company Dynamit Nobel Defence showcased three simulation products at ITEC Stuttgart in May 2018. 1. Effector 90 simulator that is based on DND's Effector 90 anti-tank weapon. Simulator allows complete functionality of weapon to be simulated and gives trainees best in class training experience. 2. Guardiaris Control Desk (GCD) that can serve as control station for other simulators or standalone mission plansning tool that has user friendly interface and can be adjusted by height and angle. 3. Remote Weapon Station simulator (RWS-S) that is located inside the BOX and features big screens to reproduce simulated interior of the vehicle and provide immersive experience for trainees. Guardiaris and Dynamit Nobel Defence showcased RGW90 anti-tank simulator and Remote Weapon Station simulator. 1. RGW90 simulator that is based on DND's RGW 90 anti-tank weapon. Simulator allows complete functionality of weapon to be simulated and gives trainees best in class training experience. 2. Guardiaris Control Desk (GCD) that can serve as control station for other simulators or standalone mission planing tool that has user friendly interface and can be adjusted by height and angle. 3. Remote Weapon Station simulator (RWS-S) that is located inside the BOX and features big screens to reproduce simulated interior of the vehicle and provide immersive experience for trainees. Generic driver station was attached to simulator. We showcased Guardiaris Mortar Simulator (M-S) and Forward Observer Simulator (FO-T) along with Guard Control Desk instructor station. Guardiaris exhibited on Slovenian Pavilion with other representatives of Slovenian Defence Industry. 2. Forward Observer Simulator (FO-T) that provides efficient training to forward observers and can train procedures of artillery firing. G-DOME is patented invention and the only non-laser based light weapons training on the market. It is one-of-a-kind personal weapon trainer featuring highly immersive tactical training of observation, target selection and elimination in up to 360° environment projection. Patented IR-LED technology, supported by highly advanced VR technology, enables real-time trainee monitoring, collecting exact information about their position, orientation and aiming direction. Wirelessly driven system gives each trainee the ability to freely move within the G-DOME area. Different training weapons, from small arms to anti-tank weapons, may be used in the G-DOME. G-DOME technology allows multiple systems to be networked together, enabling simultaneous training of multiple trainees on different locations in a common battlefield, featuring unprecedented realism giving the G-DOME edge over similar products on the market. In May, Guardiaris attended ITEC fair in Rotterdam, Netherlands. ITEC is biggest military simulations exhibition and conference in this part of the Europe. Guardiaris, together with German company Dynamit Nobel Defence showcased revolutionary G-DOME that allows trainees to move inside predefined area. Dynamit Noble Defence's RGW90 weapon simulator was used in G-DOME simulator. We have presented our Remote Weapon Station (RWS-S) simulator, RGW90 anti-tank simulator that is based on Dynamit Nobel Defence's RGW 90 weapon and Forward Observer (FO-T) simulator. Guardiaris presented wide range of simulators including our latest innovation - GUARD DOME. In December, Guardiaris hosted Military attachés from over 35 countries on a presentation of our innovative products. The main attraction was 12-meter Guard Dome simulator, which showcased Guardiaris' latest product based on our newly developed and patented technology. In October, Guardiaris held a special presentation event for selected members of MOD. The event was a showcase of a wide range of Guardiaris innovative solutions and the participants were able to try all of the simulators for themselves. It was a good opportunity for guests to see the importance of simulators and their endless training possibilities. 1. Guardiaris exibit on ES 2016 based on invitation of Slovenian MOD. Company stand was a part of Slovene Defence Industry pavilion, where MANPATS RGW90 Simulator, SAS-S as FN Herstal's SCAR, RWS-S, and our latest development Forward observer Trainer and Mortar Simulator were presented. All listed simulator systems were interconnected into a unique real-time VR environment running simultaneously on proprietary engine in a common training scenario and were controlled via Guard Control Desk. Based on visitors responses Guardiaris proved their vision of MOBILE TRAINING SIMULATION future. 2. Guardiaris Effector 90 and FO-T simulators under the brand name DynaSim were also presented on a Dynamit Nobel Defence stand, which was visited by many delegations from all over the world. Training and simulation for the MANPATS family as »State of the art simulation systems« were successfully performed. 3. Croatian company DOK-ING has been also exhibiting Guardiaris innovative solutions and endless training possibilities on a demining vehicles MV-4 and XLPD. Presented solutions received from customers no other but the positive feedback all confirming that training is not a cost, it's an investment into the future.